← Flap, Flap, Flap, and Away! Flappy Bird may no longer be available in app stores but its legacy plays on through millions of players worldwide. This simple but very challenging game may entertain you but can frustrate you at the same time, enough to cause screen scratches on your iPhone or even break the poor device. I’ve even heard some literally throw their device in frustration! So how do you beat this game? You’re lucky enough to even reach a score of over 20, 50, even close to 100. But there are players who claim the bragging rights to have beaten the game. How did they do it? Can you be able to do the same? Find out. There are four ways you can beat Flappy Bird. The first two are presented through videos. In this video, the player shows a tutorial that will hack the game in order to make the bird simply fly over the pipes until you reach the last one. Hacking and cheating in a game isn’t anything new. In fact, almost all popular games and apps have cheating methods in order to win the game. In Candy Crush for one, you can set an unlimited timer for timed levels and specify number of moves even up to unlimited as well for levels with a limited number of moves. In Temple Run, you can have a never ending supply of gems to save your player and coins to purchase upgrades. The list goes on. Not your style? The next video might interest you. If you can’t beat them, join them is not an applicable motto to this game. Instead, say “if you can’t beat it, beat it!” Literally, players have been pissed off not progressing towards the next level with this game and started beating it by thrashing their phone. Some have even posted about their rants through YouTube such as this video. Ah, poor phone! If you have no plans of destroying your precious gadget over a rather seemingly ruthless game, refer to the third option. With a little patience and lots of practice, you can soon master the perfect old school style of beating this game. This entails no less than honest to goodness gaming by tapping your phone screen at the right moment alone to keep the bird in flight while avoiding obstacles. Looks can definitely be deceiving sometimes so don’t be fooled by the sheer simplicity of this game. A lot of skills can be tested on the waters when playing such as hand and eye movement coordination. But practice makes perfect so they say. Just keep on playing and you will soon reap the rewards of sleepless nights and corns on your fingers. Last but not the least is the option to replace the game with an alternative. After Flappy Bird’s removal from app stores had been announced, several similar games had surfaced. All of them are using the same mechanism of a main character dodging pipes. Some of such include City Bird, Splashy Fish, and Flying Cyrus. The latter had been the most well received amongst all Flappy Bird wannabees. It showcases Miley Cyrus flying with sledgehammers and wrecking balls as obstacles. Still want to beat Flappy Bird? Go over our four featured ways on how to beat the game and utilize your preferred option. 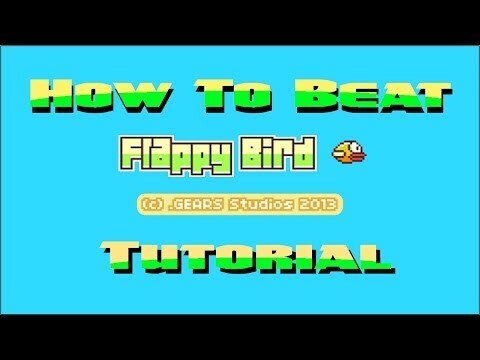 This entry was posted in Apps, How To's and tagged flappy bird tutorial. Bookmark the permalink.